We put our hands on the two stunning novelties from IWC regarding their elegance product line; Portofino. Recently this year, IWC presented a special version of the Portofino product line released at the event for the Tribeca Film Festival 2015. Same watch later had been on auction at Christie’s. Interestingly, this special timepiece came with a brand new in-house caliber, never had been used before in the rest of the Portofino collection: a manual-winding mono-pusher chronograph. 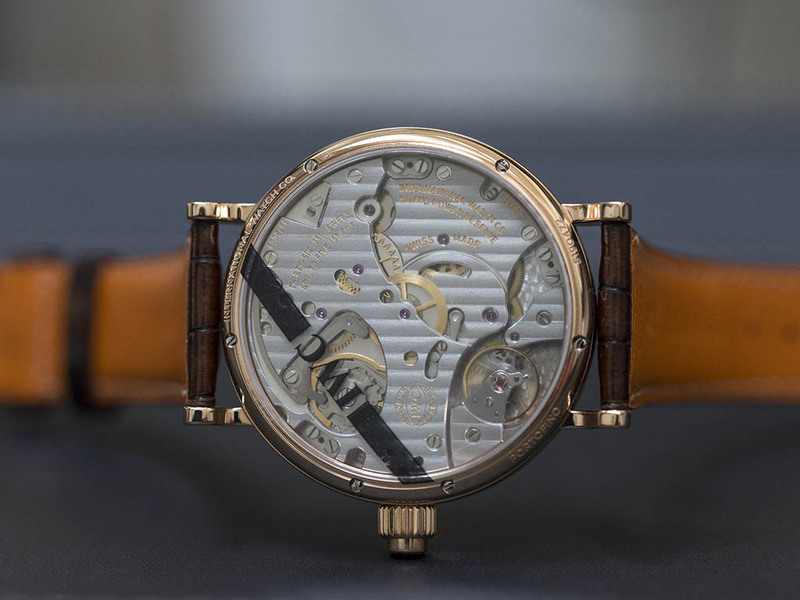 We had a feeling that this was not just an exclusive attempt but actually this was a premiering timepiece for the brand's new in-house manual winding 8 days monopusher chronograph movement. The rose gold case has a 45mm diameter which naturally results at a higher level of wrist presence. With the addition of the rose gold tone, the watch looks stunning. The mirror polished case features short lugs which even makes that watch look bigger than it really is. I am not saying this as a negative comment. In fact I liked that a lot. 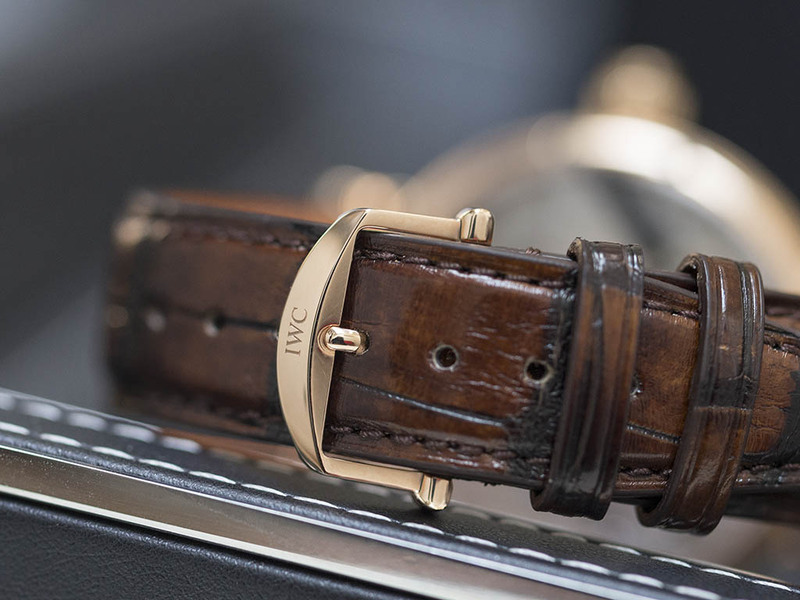 Excluding the thickness which is a tad more than the rest of the family at 13mm., the IWC Portofino Hand-Wound Monopusher is quite similar to the rest of the collection at 45mm case diameter. The dial is absolutely stunning. With it's silver plating, it's surely one of the most eye catching parts of the watch. The dial matches the rose gold case beautifully. Beside it's aesthetically success, it also sports a brilliantly designed lay out which allows to house a number of functions while nut hurting the overall elegant look. The chronograph functions can be operated by a single pusher, which is integrated in the crown. By pushing this button, you can start and then stop the chronograph. Then with a third push the chronograph counter will be reset to zero. It records up to 60-minute time intervals, which are displayed in the subsidiary counter at 12 o’clock. The chronograph second's location is above the central axis as a common feature. The other sub dial at 6 displays the seconds. 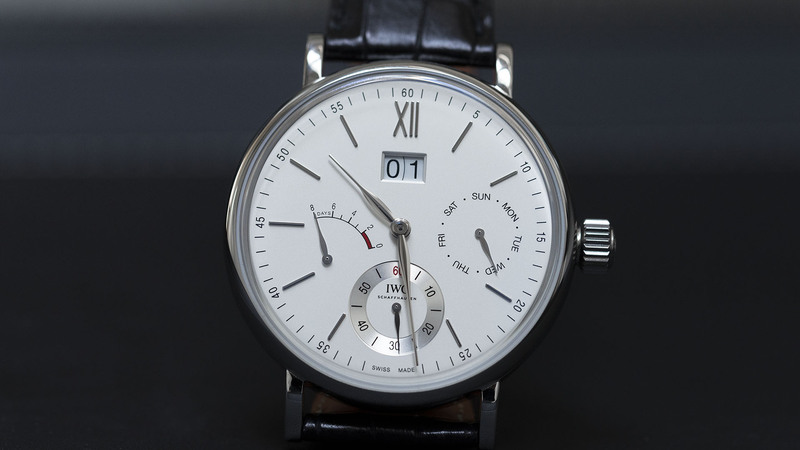 Similar to the lay out at IWC Portofino Hand-Wound Eight Days, the IWC Portofino Hand-Wound Monopusher keeps the date displayed though a small aperture at 3 o’clock and the power reserve located at 9 o’clock position as well. 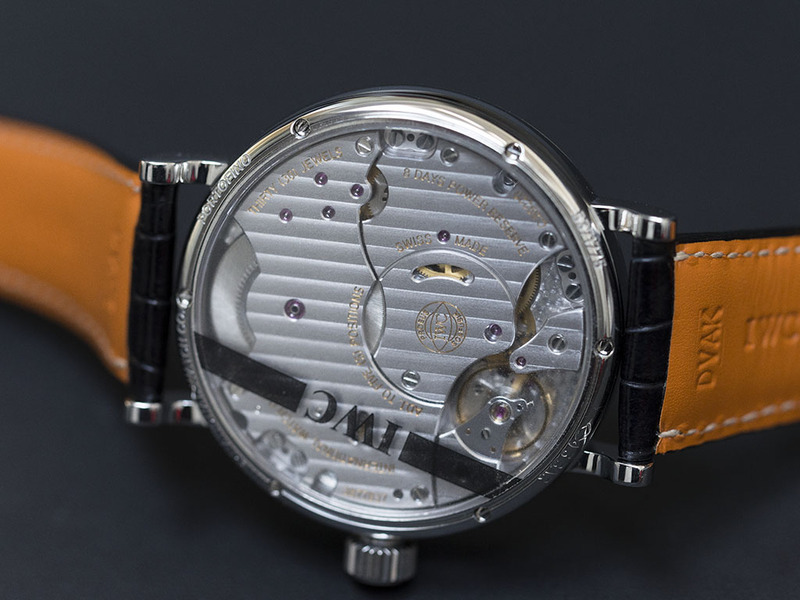 The transparent case back allows the user to see a pleasant view as the movement completely fills the case like a big pocket watch's caliber. 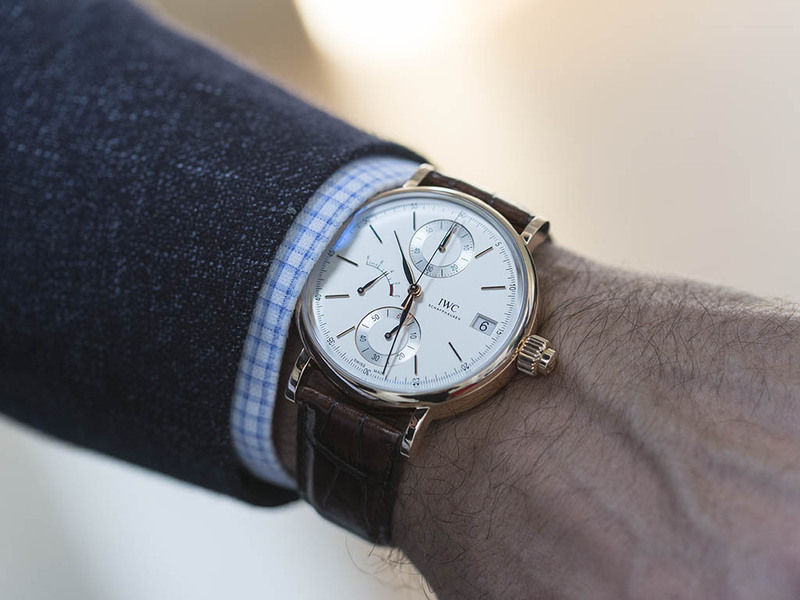 Basically, this new IWC Portofino Hand-Wound Monopusher Chronograph is a mechanical update to the previous IWC Portofino Hand-Wound Eight Days. 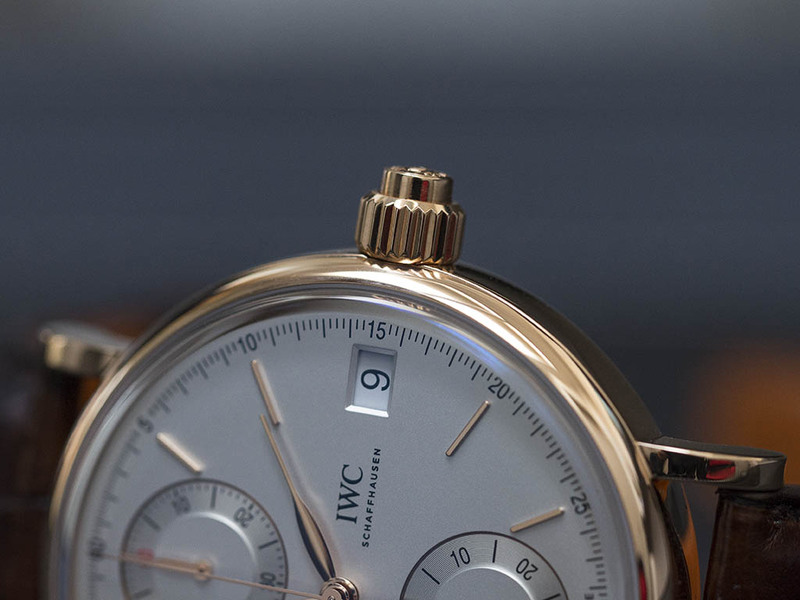 IWC simply used this and added a chronograph module. Technically speaking, it was a a visible module and actually a highly advanced one as a column-wheel mechanism with single pusher. With the large single barrel in order to get the massive 192h power reserve looks quite neat. The watch comes on a fine crocodile strap in brown color. Perfectly matching with the 18K rose gold case and the deployant clasp, the strap feels very comfortable on the wrist with a nicely balanced weight. Though I liked the watch in general, I must admit that I am not a dress chronograph person. 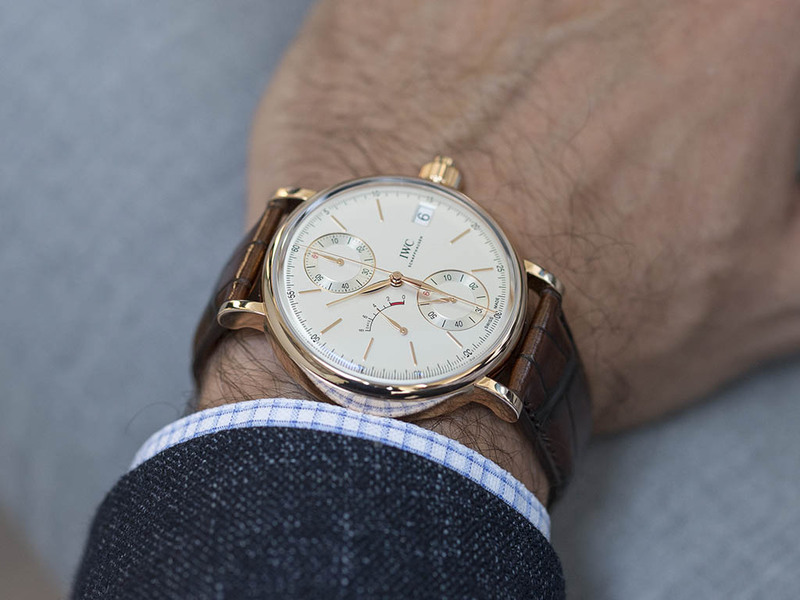 However, the IWC Portofino Hand-Wound Monopusher barely reveals it's chronograph function by the looks thanks to it's monopusher complication and it's cleverly designed display. 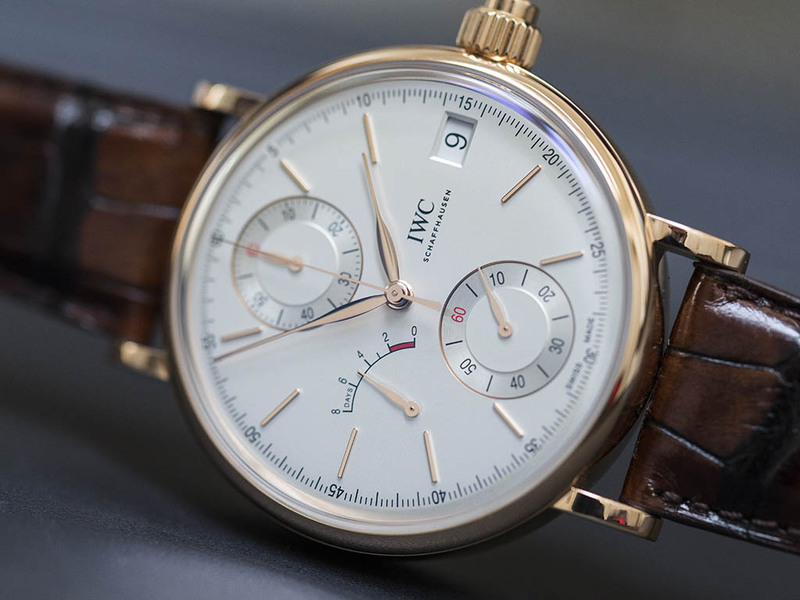 I am very glad that IWC managed to keep the retro design of the collection after adding a chronograph version that usually brings a heavy load to an elegant design. 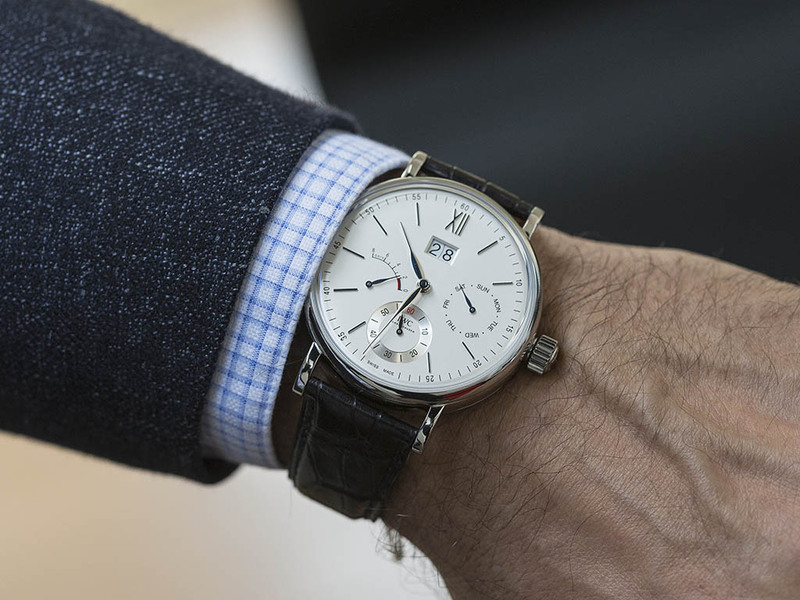 During Watches & Wonders 2015 IWC came up with another novelty: the IWC Portofino Hand-Wound Day & Date. The new Portofino Day & Date offers interesting features, all based on the same marvelous and an impressing 8 days power reserve manual wound in-house movement. The IWC Portofino is always praised with it looks and stands for the elegant and retro mooded side of the brand, with it's large, round case and it's pure and simple dial. 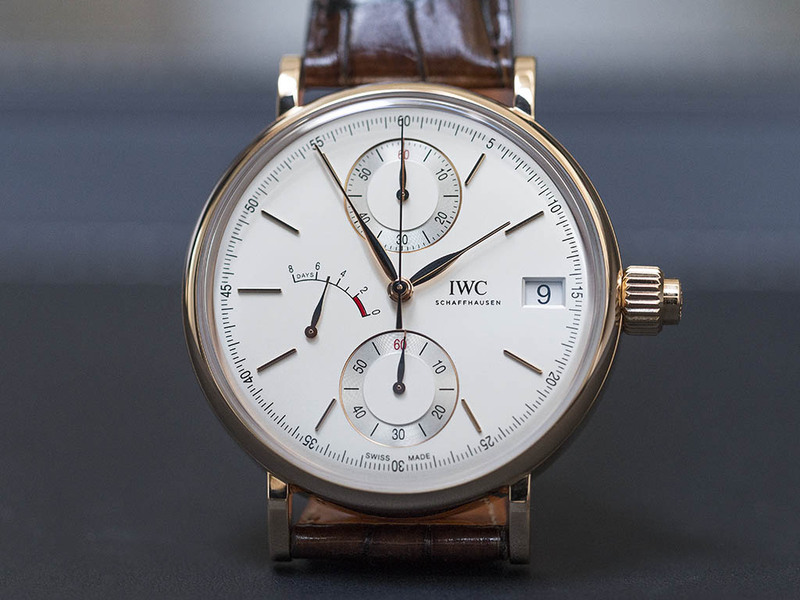 While bearing almost every classic detail of the family, it is actually the use of IWC’s own movement makes this watch kind of unique. 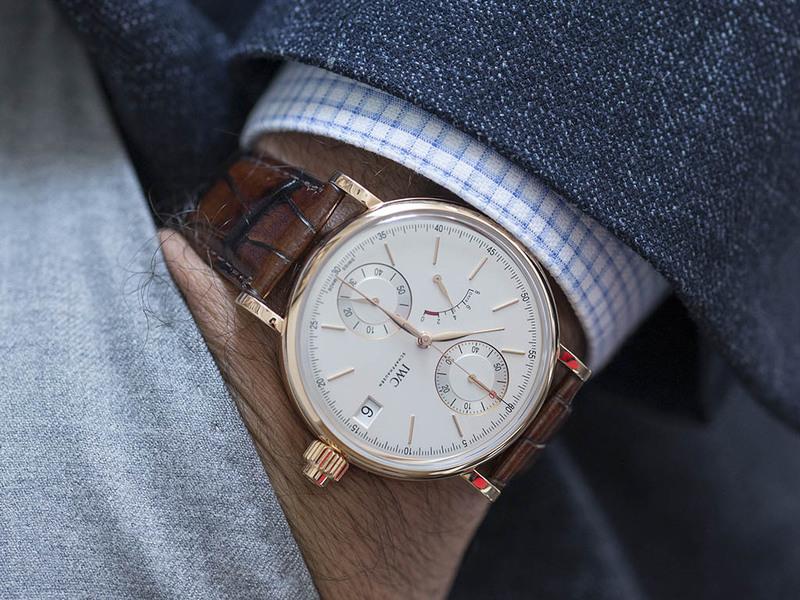 With a very large diameter that completely fills the case just like the IWC Portofino Hand-Wound Monopusher it is extremely pleasant to watch. The watch is powered by the in-house Calibre 59220 featuring a single but large mainspring that is able to provide the required energy to the watch during 8 days. However, exclusive to the IWC Portofino Hand-Wound Day & Date, it features a brand new combination of fucntions..
Actually, we are familiar with this movement with several occasions; a time only edition with the Portofino Pure Classic, a power-reserve indicator and a small second hand version in the Portofino Hand-Wound Eight Days and an extra large date in a third edition. As per our review above, it is also present with a chronograph module in the Monopusher Chronograph Edition. 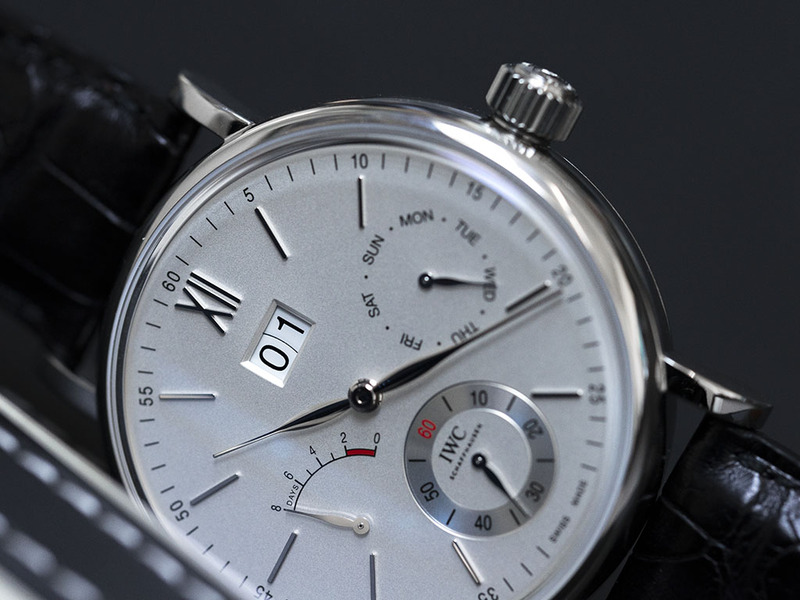 With their latest edition, IWC chose to add the day of the week (located at 3) together with the large date (at 12), the power reserve indicator (at 8) and the small second (at 6). 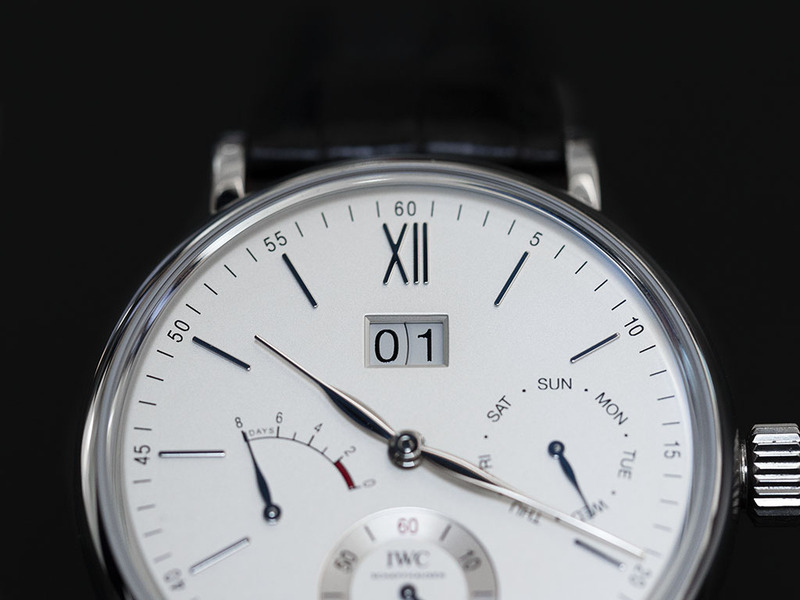 The day is classically displayed in a subsidiary dial with a rotating hand. I like the dial layout. 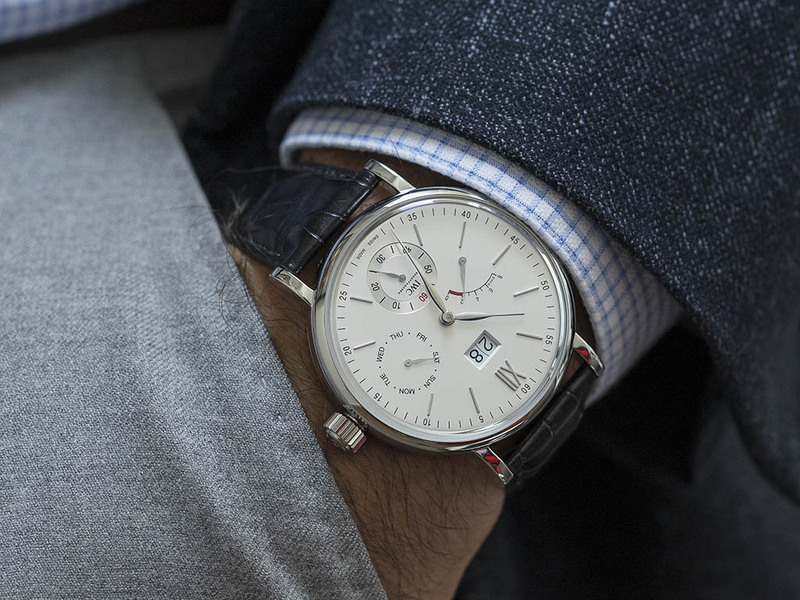 Though I am not a big fan of big date style, I think the dial is still on the elegance side. 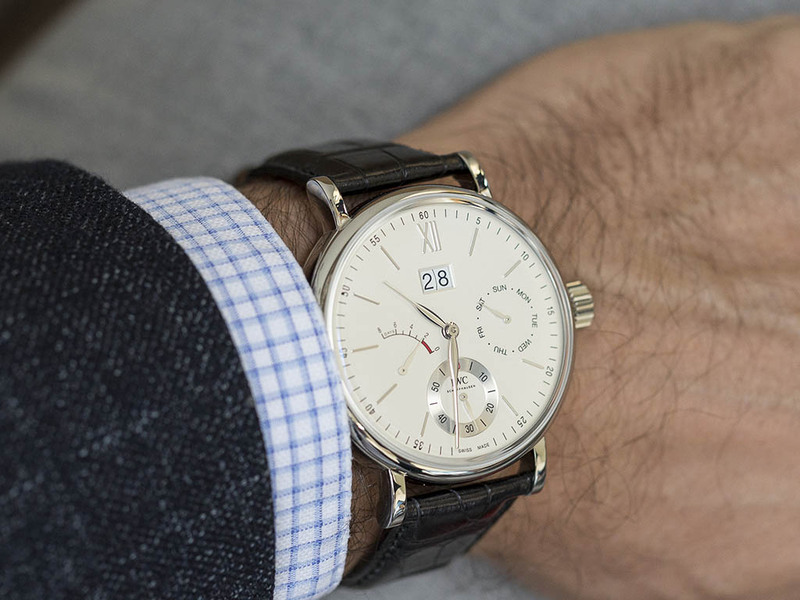 The IWC Portofino Hand-Wound Day & Date comes in the same 45mm case like the rest of the collection. Unlike the 18K rose gold version, the case now looks way sportier than before with stainless steel. The massive size of the case helps a lot in this regard but never in an unpleasant manner. Same transparent case back with the Mono-pusher Chronograph version is again a neat future. It is nice to be able to see the caliber fully filling the case. The watch is being offered on a high quality black Santoni strap. With the presence of stainless steel and the silver plated light color dial, the strap adds the final touch to get the superior retro look. 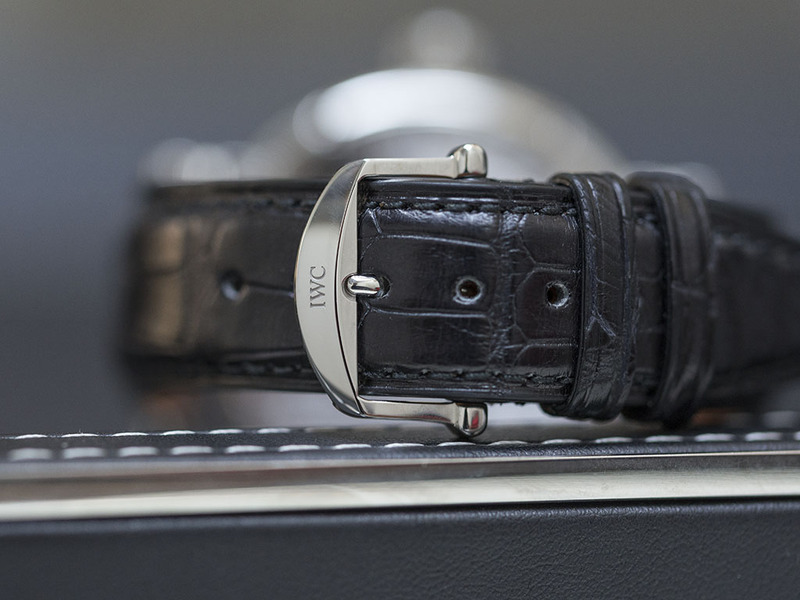 The stainless steel deployant clasp is an IWC classic making no place for a second thought.